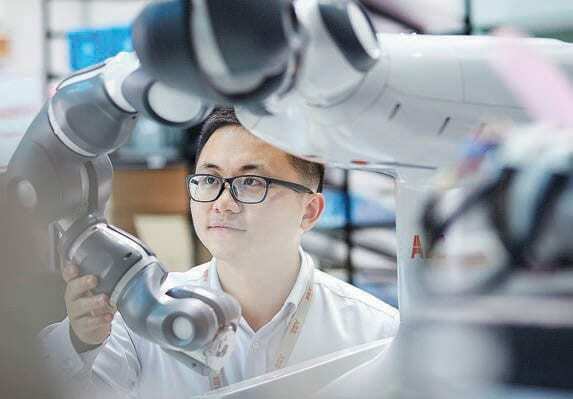 Unwavering precision, tireless efficiency and outstanding reliability will ensure robots continue to make significant inroads into the manufacturing sector and help them shape the factories of the future. Many of the statistics surrounding industrial robots are striking, both in their magnitude and their progression. The International Federation of Robotics (IFR) reports that global sales of robotic systems grew by 30% in 2017, to 381,335 units. Asia remains the powerhouse growth market, with around 261,800 units sold in 2017, a rise of 37% and more than the combined global sales volume of just two years earlier (253,300). Industrial robot sales in Europe, the second largest market, increased by 18%, to almost 66,300 units -the fifth consecutive year of new record sales. Meanwhile, around 46,100 industrial robots were shipped to the Americas, 12% more than in 2016; a new high for the sixth successive year. The number of industrial robots shipped into Europe rose by 7% in 2018, according to the IFR, which has predicted an average annual growth rate of 10% for the years 2019 to 2021. 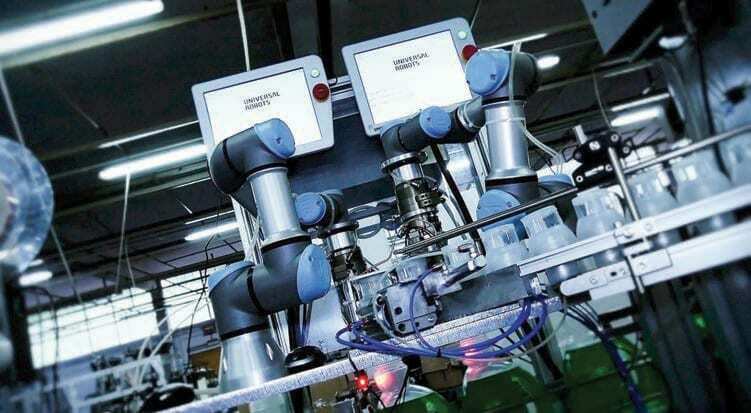 While doubledigit growth has recently become more uncertain because of fears about a slower world economy, the overall trend for industrial robots remains relentlessly positive. 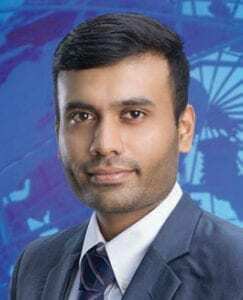 Rohit Karthikeyan, senior analyst for industrials at Frost & Sullivan, business consultants, estimates 2018 global revenue at $49.08bn. It forecasts that the global industrial robotics market will double in value to reach US$70.26 billion by 2023, growing at a compound annual growth rate (CAGR) of 8.1%. Optimus Prime (the Transformer character) would be proud of these impressive growth figures but they are unsurprising, given the compelling list of solid business benefits that industrial robots offer. They can, for example, dramatically cut the cost of materials and labour and remove workers from difficult or hazardous environments, as well as increase product quality and throughput. 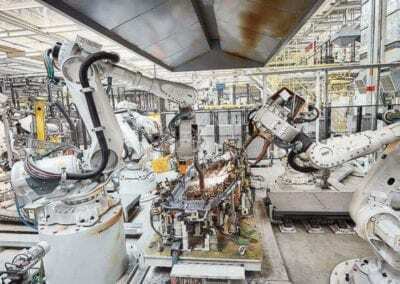 For Phil Webb, head of the Centre for Structures, Assembly and Intelligent Automation at Cranfield University, the robotics market is growing because cost pressures are building. “If you look at China, for instance, labour unit costs are rising; they have much more of a sort of middle class who want to buy the goods that they make and that’s pushing up labour rates,” he said. Globally, manufacturing is responsible for increasing the uptake of robotics significantly, particularly in emerging economies like China, which is now installing more robots per year than any other country. Indeed, China has been the biggest robot market in the world since 2013. Karthikeyan estimates that China, Korea, Japan, USA and Germany account for around 75% of global robot supply. The UK remains well behind the curve. …so why is the UK behind the curve? 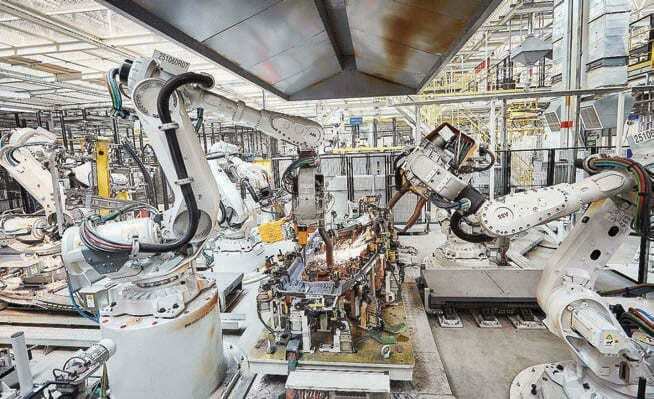 Mike Wilson, business development manager UK & Ireland at ABB and president of the British Automation and Robot Association (BARA), says there is no simple answer as to why the UK is performing so poorly relative to its competitors overseas. “We [in the UK] tend to look at our investments in capital equipment on a much more short-term basis than many of our major competitors,” he said. “There are a lot of companies looking for a one-year return here, whereas, in Germany, they are probably more often looking for a three-year return on investment, which makes it much easier to invest. “We also have potential skills shortages in terms of engineers able to define and implement solutions. We have a culture where we tend to keep all our old machinery running rather than investing in new. We have quite a flexible labour force [which is also] related to return on investment. If taking a worker on means you are committed to that worker for a long period of time, you might look at automating the job.” Webb, of Cranfield, agrees that the UK is punching below its weight in robotics and automation. “We are where we always seem to be; despite our best efforts, the rest of the world is expanding and developing, and the UK is lagging,” he said. 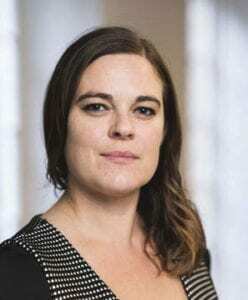 “There have been a lot of initiatives but I think there are misconceptions about the cost and complexity of introducing robotics; the overheads and payback and so on. I don’t think people see the big picture [and, as a result, many fail to invest in robotics].” Tom Bouchier, managing director of FANUC UK, confirms that the UK is behind many of its European counterparts. 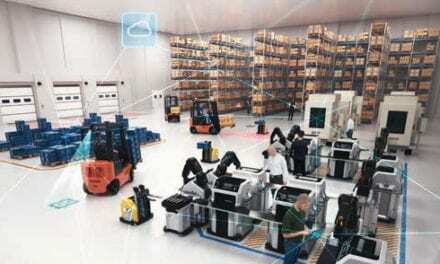 “There are just 71 industrial robots per 10,000 workers in the UK. That positions the UK behind 14 other European countries and, alarmingly, [we are] the only G7 country with a robot density below the world’s average (74 units),” he pointed out. 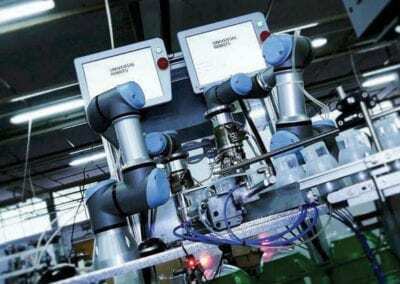 “In contrast, Germany – Europe’s most automated country – has 309 units while the Czech Republic, the closest European country to the UK, has 101 units per 10,000 workers.” Dom Dangelillo, marketing and media co-ordinator at robotic & automation systems integrator Bauromat, is in full agreement. 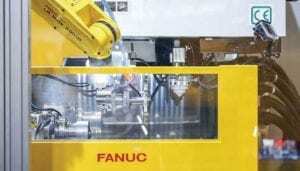 “One possible reason for the UK’s low performance could be linked to the stigma attached to the use of robotics and unemployment,” says FANUC’s Bouchier. 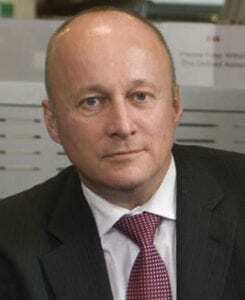 “If the UK is to catch up with the rest of the world, it’s going to need to adopt more automation in its manufacturing facilities and, therefore, shift this viewpoint.” The perceived costs often – wrongly – associated with industrial robotics can also play a role in UK manufacturers choosing not to adopt new technology in their plants, he believes. 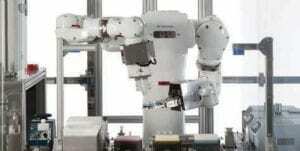 “However, industrial robots are not as expensive as people think. On many occasions, the return on investment can be recouped in as little as 18 months.” BARA’s Wilson concludes on a brighter note. “In the UK, we now have an industrial strategy from the government. 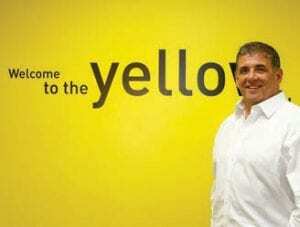 That led to the Made Smarter review, which identifies the benefits of digitalisation,” he said. Robotics is very much part of that. “The Review recognised that, I think, over the next 10 years robotics and automation could be worth something like £184bn to the UK economy which indicates the size of the prize. Notwithstanding preoccupations like Brexit, the opportunity is significant; it is on the government’s radar. Wilson believes that, if we as a country can get our act together, there is a significant opportunity. Industrial automation – using computeraided control devices to operate different industrial processes by replacing human involvement – is certainly on the up and up. However, you must (quite literally) pay your money and make your choice over which report to buy and, therefore, which figures to believe. The global industrial automation market is expected to grow at US$149bn by 2022 at 6% of CAGR between 2016 and 2022, according Market Research Future. Its study – Industrial Automation Market Research Report – identifies the drivers for this growth as including the advantages of industrial automation such as lower operating cost, reduction in human error, lower wastage, efficient manufacturing, synchronisation of procedures, quality production and faster product lifecycle. The IHS Markit Q1 2018 Industrial Automation Equipment Market Tracker, meanwhile, estimates the global automation market at US$202.2bn in 2017, US$209.8bn in 2018 and a projected US$218.2bn in 2019. The GAMBICA Index – an indicator of the level of business for the UK’s industrial automation, process instrumentation, and control and laboratory technology sectors – reveals 9.3% growth in 2017 (the strongest in the last decade). The industrial automation sector saw a 14% improvement on the previous year, placing the sector back to the level it would have been without the 2015 downturn, according to trade association GAMBICA. GAMBICA, said. “Whether that means more people are investing in automation or it’s just a matter of repairing old kit, I don’t have sufficient information. But given the recent uncertainty around Brexit, we saw an uptick in the sales of automation equipment after the referendum.” When the referendum was announced, there was a fall in sales of automation equipment. This uptick may have been a bounce-back, reflecting that organisations had decided defer investments until the outcome of the referendum was known. About three months after the result, she says, nothing had changed significantly apart from a precipitous drop in sterling. Businesses were buoyed by the weak pound, which led to quite a strong bounce back. Emerging economies such as China and Mexico, meanwhile, are investing in automation, “probably to the levels that the UK should be, but isn’t”, says Montag. There are many reasons put forward as to why this may be so. Prosperity Partnerships: What Are They?